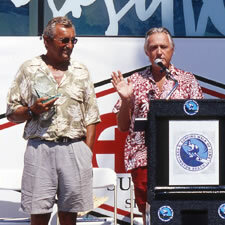 Mike Doyle "2003 Surf Pioneer"
Raised in the South Bay, Mike worked as an apprentice to Dale Velzy and Greg Noll shaping balsa boards in 1959. He modeled himself after true Polynesian watermen: excelling in surfing, paddling, tandem, rowing, ocean swimming, free diving and fishing. 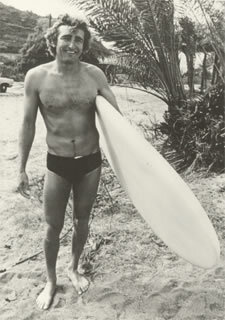 Doyle traveled to the North Shore in the winter of 1959 along with a small cadre of Californian surfers, helping pioneer what is now an often taken-for-granted annual migration.He won his first Iron Man competition in 1960 in San Diego and was Surfer poll winner in 1964.